The mortality rate from acute kidney injury after major cardiovascular operations can be as high as 60%, and no therapies have been proved to prevent acute kidney injury in this setting. Here, we show that preconditioning with the anesthetic gas xenon activates hypoxia-inducible factor 1α (HIF-1α) and its downstream effectors erythropoietin and vascular endothelial growth factor in a time-dependent manner in the kidneys of adult mice. Xenon increased the efficiency of HIF-1α translation via modulation of the mammalian target of rapamycin pathway. In a model of renal ischemia-reperfusion injury, xenon provided morphologic and functional renoprotection; hydrodynamic injection of HIF-1α small interfering RNA demonstrated that this protection is HIF-1α dependent. These results suggest that xenon preconditioning is a natural inducer of HIF-1α and that administration of xenon before renal ischemia can prevent acute renal failure. If these data are confirmed in the clinical setting, then preconditioning with xenon may be beneficial before procedures that temporarily interrupt renal perfusion. Acute kidney injury as a result of ischemia followed by reperfusion is a significant clinical problem in cardiovascular surgical procedures such as thoraco-abdominal aortic aneurysm repair and renal transplantation. In these settings, interruption of renal blood flow is an inevitable component of the surgical procedure. The incidence of acute renal failure can be as high as 40% after aortic repair surgery, and mortality is approximately 60% in patients who require hemodialysis.1,2 The incidence of delayed renal graft function ranges from 2 to 50% worldwide from cadaveric donors3 and is 4 to 10% from living donors.4 Thus, renal ischemia-reperfusion injury (IRI) is a common surgical problem that results in significant morbidity and mortality. The noble gas xenon (Xe), discovered more than a century ago, has been used as an anesthetic since the 1950s, albeit with a remarkable safety profile.8 Although sparingly used because of its cost, the utility of Xe preconditioning may come to the fore as an organ-protective agent. Accordingly, the organ-protective properties of Xe preconditioning have been demonstrated for the heart9 and brain.10 Here, we show that Xe preconditioning protects against IRI to the kidney in mice and that the mechanism is due to increased expression of HIF-1α as well as its downstream effectors through enhanced translational efficiency involving the mammalian target of rapamycin (mTOR) pathway. To determine whether Xe preconditioning activates HIF-1α, we measured HIF-1α protein expression and selected downstream effectors erythropoietin (EPO) and vascular endothelial growth factor (VEGF) in the adult kidney after exposure of mice (C57BL/6J) to 70% Xe/30% O2 for 2 h. Kidneys from control mice (exposed to 70% nitrogen [N2]/30% O2; control) had barely detectable levels, whereas HIF-1α levels were significantly increased from 2 h after Xe preconditioning (1.91 ± 0.50 versus 1.00 ± 0.02 of control; P < 0.05), with further upregulation (3.86 ± 1.15 versus 1.00 ± 0.02 of control; P < 0.01) at 24 h (Figure 1A). Downstream effectors of HIF-1α, EPO and VEGF, were also significantly increased by 160 and 110%, respectively (P < 0.01), at 24 h after Xe preconditioning compared with controls (Figure 1, B and C). This is not an effect of anesthesia per se, because another anesthetic gas mixture, 70% nitrous oxide [N2O]/30% O2, did not induce changes in HIF-1α expression (Figure 1D) or its downstream effectors (data not shown). Strikingly, HIF-1α induced by exposure of mice to a hypoxic exposure (8% O2 for 3 h) declined rapidly to baseline levels by 2 h after hypoxia (Figure 1E), in contrast to the sustained elevation seen after Xe preconditioning. These results indicate that Xe is an anesthetic gas with HIF-1α–inducing capability and suggest that the mechanism is different from that of hypoxia, a common physiologic HIF-1α inducer. Xe activates HIF in the mouse kidney in vivo and in cultured HK2 cells. Mice were exposed to 70% N2, 70% Xe, and 70% N2O, for 2 h. As a positive control for HIF activation, mice were exposed to 8% O2. Renal cortices were harvested for immunoblot from 0 to 24 h after treatments. (A) Xe significantly increased HIF-1α expression from 2 h after exposure (n = 5 to 6 at each time point) compared with N2 control. (B) Xe significantly increased EPO expression (n = 5 to 6) 24 h after exposure compared with N2 (control). (C) Xe significantly increased expression VEGF expression (n = 5 to 6) from 8 h after exposure compared with N2 control. (D) Exposure to the anesthetic gas, N2O, did not affect HIF-1α expression (n = 4). (E) Effect of hypoxia on HIF-1α expression (n = 5) was NS ≥2 h after exposure compared with N2 control. (F) Xe significantly increases HIF-1α expression from 8 h after exposure (n = 4 at each time point) compared with N2 control in HK2 cell line. Data are means ± SD. C, control. *P < 0.05, **P < 0.01 versus control. Next we preconditioned HK2, a well-characterized human kidney proximal tubular epithelial cell line, to Xe. HK2 cells exhibited HIF-1α activation with similar kinetics to those observed in the kidney in vivo (Figure 1F). Thus, Xe preconditioning activates HIF-1α in isolated renal epithelial cells. HIF-1α is regulated by ubiquitination of the α subunit; in the presence of O2, these are hydroxylated, which permits capture by the VHL protein and subsequent destruction via the 26S proteasome. To determine whether Xe preconditioning activates HIF-1α by impairing destruction via this pathway, we used RCC4 cells, which lack VHL, and an otherwise isogenic subline stably transfected with pcDNA3-VHL. As expected, RCC4 without VHL (RCC4−) cells expressed a higher level of HIF-1α compared with RCC4+ cells, which are stably transfected with VHL. Both cell lines showed a similar time-dependent increase in HIF-1α after Xe preconditioning. 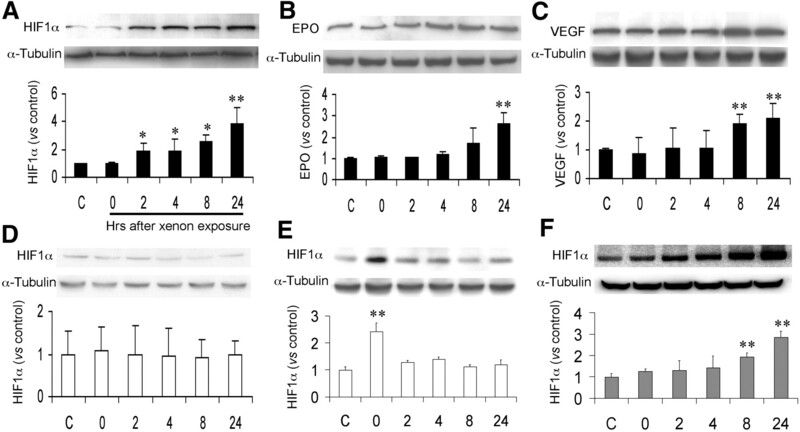 Thus, Xe-induced increase in HIF-1α expression is not dependent on VHL (Figure 2A). We also found that Xe preconditioning does not alter the amount of the prolyl hydroxylase domain–containing 2 enzyme, which is usually the most important HIF prolyl hydroxylase (Figure 2B); therefore, Xe preconditioning does not activate HIF via the canonical HIF-1α destruction pathway. HIF-1α abundance can be regulated at the level of gene transcription or mRNA translation. HIF-1α mRNA in cells preconditioned with Xe did not differ from those maintained under control conditions (Figure 2C). To determine the role of Xe preconditioning in modulating the translational efficiency of HIF-1α mRNA, we studied the effect of Xe preconditioning on mTOR, a key integrator and transducer of numerous intracellular signaling pathways and a well-described regulator of protein translation.11 Interestingly, preconditioning with Xe was found to increase expression of mTOR protein from 2 h after the preconditioning stimulus, with maximal expression occurring at 24 h after Xe preconditioning (5.93 ± 0.68 versus 1.00 ± 0.10 of control; P < 0.001; Figure 2D). To explore the significance of the increase in mTOR protein expression, we exposed cells to Xe in the presence of rapamycin (an inhibitor of mTOR), at 25, 50, and 100 nM, and studied the protein expression of HIF-1α 24 h after Xe preconditioning. Rapamycin alone did not alter HIF-1α expression when compared with control; as expected, Xe preconditioning alone increased expression of HIF-1α expression; however, the concurrent administration of rapamycin during Xe preconditioning significantly inhibited Xe-induced HIF-1α, with greatest HIF-1α inhibition occurring at the highest concentration of rapamycin that we tested (100 nM 0.83 ± 0.21 versus 2.83 ± 0.71, compared with Xe preconditioning alone; Figure 2E). Xe preconditioning also increased mTOR expression in mouse kidneys as shown in vitro (Figure 2F). We next administered rapamycin 1.5 mg/kg, intraperitoneally, to mice just before the administration of Xe. As we had observed in the in vitro study, rapamycin attenuated Xe-induced increase in HIF-1α expression in the kidneys of mice (Figure 2G). Exploration of mechanisms for increased level of HIF-1α protein. For in vitro experiments, RCC4+ VHL were exposed to 70% Xe balanced with O2 for 2 h and harvested at 0 to 24 h after this. (A) Exposure to Xe increases HIF-1α expression whether the VHL ubiquitylation process is present (RCC4+ cells) or absent (RCC4− cells) (an example of three independent experiments). (B) In vivo effects of HIF prolyl hydroxylase domain–containing 2 (PHD2) enzyme. Exposure to Xe does not increase expression of the enzyme HIF PHD2 in RCC4+ VHL cells (n = 4). (C) Reverse transcription–PCR revealed that exposure to Xe did not alter the level of HIF-1α mRNA (n = 4). (D) Xe exposure significantly increased expression of the protein mTOR after 24 h (n = 4). C, control. *P < 0.05, **P < 0.01, ***P < 0.001 versus control. (E) Rapamycin (R), an mTOR inhibitor, attenuates Xe-induced HIF-1α expression 24 h after exposure. *P < 0.05, **P < 0.01 versus Xe (n = 4). (F) Xe exposure caused a time-dependent increase expression of mTOR in the mouse kidney (an example of three independent experiments). (G) In vivo, pretreatment with R 1.5 mg/kg intraperitoneally prevented enhancement of HIF-1α expression (an example of three independent experiments). Data are means ± SD. To determine whether preconditioning with Xe provides protection against renal ischemia followed by reperfusion in mice and whether this was mediated by HIF-1α, we developed a genetic knockdown approach because HIF-1α knockout mice are not available owing to embryonic lethality.12 Small interfering RNA (siRNA) technology against HIF-1α was delivered by hydrodynamic injection.13 First, we verified delivery of synthetic double-stranded 3′-fluorescein-labeled scrambled siRNA (50 μg in 1 ml of PBS) into mouse tubular epithelium. Kidney tubular cells took up siRNA duplexes 24 h after injection as shown by intracellular fluorescence signals, whereas no such marker was found in PBS-injected control animals (Figure 3, A and B); this result corroborates previous data that siRNA preferentially accumulates in the kidney.14 The functional effect of this efficient delivery was confirmed by significant knockdown of HIF-1α and EPO mRNA (Figure 3C) and protein with no change in HIF-1β, which is constitutively expressed (Figure 3, D and E). In vivo effects of HIF-1α siRNA. (A and B) Injection of PBS (A) and fluorescein-labeled scrambled siRNA (B) reveals that siRNA is present in the renal parenchyma 24 h after injection. (C) Twenty-four hours after treatment with HIF-1α siRNA, expression (assessed by real-time reverse transcription–PCR) of HIF-1α and its downstream effector (EPO) was decreased. (D and E) Expression of HIF-1α (but not HIF-1β; D) and EPO (E) induced by Xe exposure was decreased 24 h after treatment with HIF-1α siRNA (n = 5). Data are means ± SD. *P < 0.05. Next, we determined whether preconditioning with Xe provides protection against renal IRI in mice when the renal pedicle of both kidneys is clamped for 25 min. Having shown the efficacy of siRNA at abrogating Xe-induced HIF-1α transcription, expression, and downstream activity (Figure 3), we investigated whether the renoprotective effect of Xe preconditioning could be abolished by knocking down HIF-1α. Twenty-four hours after IRI, kidneys and blood were harvested for histologic assessment and for renal function (serum creatinine and urea), respectively. Morphologic evidence of renal IRI was assessed using a histopathologic scoring of cortical tubular damage by an investigator who was unaware of the experimental protocol. The histologic score in the absence of Xe preconditioning was 259 ± 17, which decreased to 54 ± 19 (P < 0.01) and 69 ± 20 (P < 0.01) in PBS or negative control siRNA injection with Xe preconditioning, respectively; pretreatment with HIF-1α siRNA injection abrogated the renoprotective effect of Xe preconditioning (284 ± 6; P > 0.05; Figure 4A). Qualitatively similar changes were noted in renal function; after IRI, notably, the plasma creatinine rose from 35.0 ± 1.2 to 162.0 ± 18.0 μM/L. Previous exposure to Xe preconditioning was protective, with creatinine showing no significant difference from animals not subjected to renal injury. When Xe preconditioning was preceded by HIF-1α siRNA injection, this abrogated the protective effect so that creatinine was significantly (P < 0.05) higher (91 ± 58) than that seen in the uninjured animals (Figure 4B). Changes in plasma urea were similar (Figure 4C). In vivo renoprotection by Xe versus renal IRI. Mice were pretreated with hydrodynamically injected siRNA (or scrambled siRNA or PBS) and 24 h later were exposed to 70% N2 or 70% Xe balanced with O2 for 2 h. IRI was by bilateral clamping of the renal pedicle for 25 min, 24 h after gas exposure. (A) Quantification of histologic scoring after IRI in mice pretreated and exposed to various gas mixtures treatments (n = 6). 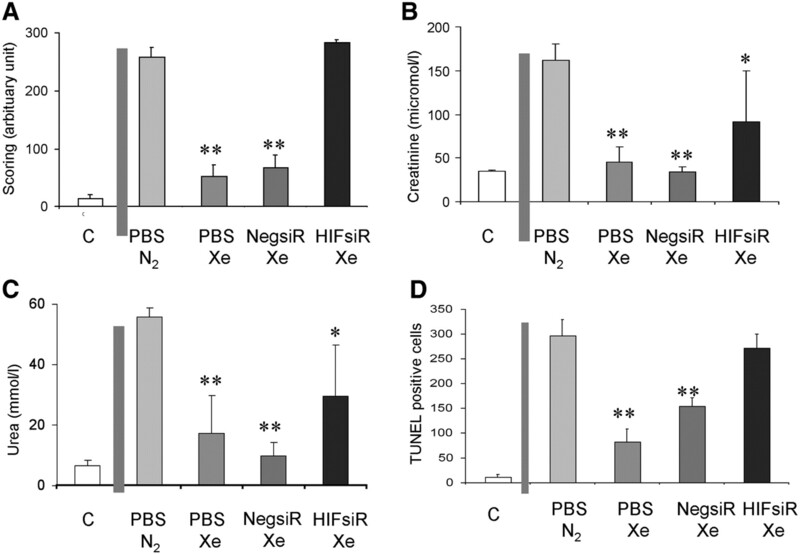 (B and C) Attenuation by HIF-1α siRNA pretreatment of the renoprotective effect of Xe in IRI as reflected by plasma creatinine (B) and plasma urea (C; n = 6). (D) Mean value of TUNEL-positive cells in renal sections after various treatments (n = 6). NegsiR, negative siRNA; HIFsiR, HIF-1α siRNA. Data are means ± SD. *P < 0.05, **P < 0.01 versus control. To evaluate kidney damage at the cellular level, we used terminal deoxynucleotidyl transferase–mediated digoxigenin-deoxyuridine nick-end labeling (TUNEL) staining to detect apoptotic tubular cells. Quantitatively, TUNEL-positive cells were significantly decreased to 82 ± 27 (P < 0.01) and 155 ± 16 (P < 0.01) in mice receiving PBS or negative siRNA injection followed by Xe preconditioning, respectively, from 297 ± 32 in the nonpreconditioned IRI mice. The latter was NS when compared with the value of 272 ± 28 (P > 0.05) in mice treated with HIF-1α siRNA injection followed by Xe preconditioning (Figure 4D). To assess whether Xe preconditioning was also effective in the context of a more severe insult to renal function (Table 1), we performed additional experiments in which the right renal pedicle was clamped for 40 min and the left kidney was removed. Long-term survival (no signs of illness at 7 d) was noted in 75% of animals preconditioned with Xe before IRI. In contrast, animals not preconditioned with Xe or preconditioned with Xe combined with HIF-1α siRNA fared much worse. Within 2 d, 38% of these animals were dead (either spontaneously or killed because of severe ill health measured against defined criteria), and no animals survived beyond 5 d after IRI (P < 0.001 versus Xe preconditioning group; Figure 5A). The mean value of plasma creatinine and urea rose more than 10-fold at day 2 (just before termination) after IRI. Animals treated with Xe preconditioning exhibited normal creatinine and urea values even at 7 d after IRI (Figure 5, B and C). Xe protects from renal failure, and this is HIF dependent. Mice were given a hydrodynamic injection of PBS or specified siRNA; 24 h later, they were exposed to 70% N2 or 70% Xe balanced with O2 for 2 h. Kidney injury was induced by clamping the right renal pedicle for 40 min. The contralateral kidney was removed 24 h after exposure. (A) Kaplan-Meier survival curve. (B and C) Plasma creatinine (B) and urea (C) from the mice with PBS or siRNA injection before Xe preconditioning (or control) followed by ischemia-reperfusion challenge. Samples were taken at the times indicated when animals were killed. Blood samples were not available from three and two animals terminated during postexperimental days 3 through 7 in the sham preconditioning and HIF-1α siRNA + Xe preconditioning groups, respectively. This study demonstrates for the first time that, under normoxic conditions, Xe preconditioning induces a sustained increase of HIF-1α activity in adult mouse kidney and in a human kidney cell line through increased translational efficiency of HIF-1α involving the mTOR pathway. The Xe-induced HIF-1α expression prevents apoptosis, renal tubular damage, renal dysfunction, and renal failure after varying degrees of IRI, and its effect is abolished with HIF-1α siRNA. HIF-1 regulates the adaptive response to hypoxia and other stresses by orchestrating the transcription of genes involved in a wide variety of cell processes—from glycolysis to angiogenesis—that promote the switch to a more tolerant phenotype. HIF target genes have themselves already been implicated in mediating protection against IRI.15 EPO upregulation during ischemic acute renal failure reduced anemia and increased renal tubular regeneration16; therefore, the manipulation of the HIF-1α pathway seems to be a promising strategy for minimizing renal IRI by disabling HIF-1α degradation with a prolyl hydroxylase domain–containing inhibitor5 or cobalt chloride.17 The data reported here clearly demonstrate that Xe preconditioning is a natural physiologic HIF-1α inducer and protects kidneys against IRI by the upregulation of HIF-1α and EPO. We now demonstrate an alternative strategy to increase HIF activity through mTOR, a large evolutionarily conserved protein kinase that plays a pivotal role in regulating mRNA translation and thereby effecting cell growth and survival.18 mTOR phosphorylates the translational inhibitor 4E-BP that leads to its inactivation and subsequent loss of its inhibitory effects on the cap-binding protein eIF-4E, a necessary component of the translation initiation complex that can activate S6 kinase.19 S6 kinase activity leads to the recruitment of ribosomal proteins S6 and eIF-4B, and these stimulate the translation of mRNA containing terminal oligopyrimidine tract 0.5′TOP) motifs in the 5′ untranslated region, including HIF-1α mRNA.20 Upregulation of HIF-1α in response to growth factor signaling via the phosphatidylinositol-3-kinase/Akt/mTOR pathway provides a route by which proliferating cells make adaptive metabolic changes and produce angiogenic growth factors, whereas inhibition of mTOR provides a route to decrease HIF-1α activation in neoplasia.21–23 Although we have not formally investigated how Xe preconditioning increases mTOR activity in the kidney, the effects of Xe preconditioning on phosphatidylinositol-3-kinase and Akt, two upstream regulators of mTOR, have been noted in the brain (unpublished observation). Whether HIF-1 has direct protective effects in renal tubular cells has been questioned24; cisplatin-induced cell apoptosis was demonstrated to be ameliorated by hypoxic exposure but not by cobalt chloride exposure, which increases HIF expression. Tanaka et al.,25 however, demonstrated amelioration of cisplatin-induced cell apoptosis by cobalt chloride administration in both in vitro and in vivo models; therefore, the role of HIF in the protective effect of hypoxia is not fully resolved. This study may have significant clinical implications because acute kidney injury is still an important contributor to patient morbidity and mortality after major vascular surgical interventions and renal transplantation.1 Xe preconditioning displays many of the favorable properties of the ideal inhalational anesthetic. It is a remarkably safe anesthetic with a fast induction and emergence as a result of its very low blood gas partition coefficient.8 Furthermore, it is the ideal “green” gas because it is returned to the atmosphere underivatized. Because the mortality rate of patients who have postoperative acute kidney failure and require hemodialysis is as high as 60%,1 there is a critical need to develop therapeutic strategies to enhance tolerance of the kidney in withstanding ischemic injury. As demonstrated here, Xe-induced HIF-1α expression prevents renal IRI, and this finding should be considered as a therapeutic strategy to be extended for clinical use; however, the renoprotective effect of Xe-induced changes of HIF-1α expression at the earlier time (e.g., 2 h after exposure, as shown in Figure 1A) remains unknown. Nevertheless, if our data can be extrapolated to clinical settings, then Xe preconditioning may serve an important protective function when administered before a variety of elective procedures in which the cessation of renal blood supply is inevitable. Ten-week-old male C57BL/6J mice weighing 20 to 25 g were housed in temperature- and humidity-controlled cages with free access to sterile acidified water and irradiated food in a specific pathogen-free facility at Imperial College London. All procedures were performed strictly under the United Kingdom Animals (Scientific Procedures) Act 1986. Deprotected and annealed HIF-1α or scrambled siRNAs with or without a 3′-fluorescein label (Qiagen, Crawley, West Sussex, UK) were dissolved in siRNA suspension buffer and further diluted in RNase-free PBS before use. HIF-1α siRNA was produced by annealing r(GCU CAA UUU AUG AAU AUU A)dTdT (sense) and r(UAA UAU UCA UAA AUU GAG C)dGdG (antisense). For hydrodynamic injection, HIF-1α or scrambled siRNA (negative control; 50 μg in 1 ml of PBS) or 1 ml of PBS was rapidly injected (within 15 s) into a tail vein via an acutely sited cannula followed by 0.3 ml of PBS flush under volatile anesthesia. Mice were exposed to either 70% Xe, 70% N2, or 70% N2O balanced with 30% O2 for 2 h or 8% O2 balanced with N2 for 3 h via an anesthetic chamber. Gas concentrations of Xe, O2, and N2O were monitored by Xe monitor (Air Products Model No. 439Xe, Bradford, UK) and Datex monitor (Datex-Ohmeda, Bradford, UK). Twenty-four hours after gas exposure, kidney IRI was induced either by bilateral renal pedicle clamping for 25 min or by right renal pedicle clamping for 40 min and left nephrectomy. Sham-operated mice had dissection as above but with no occlusion of the renal vessel. The intra-abdominal temperature was maintained at 36.0 ± 0.1°C with a heating pad which was servo-adjusted by a temperature controller (Engineering Inc., Stamford, CT) throughout the experiment. For survival experiments, mice were monitored on a daily basis with a scoring assay based on body weight, activity, and general appearance (Table 1). Any mice that scored >7 were killed. HK2 cells are derived from adult human kidney proximal tubular epithelial cells. RCC4− and RCC4+ refer to two derivatives of the VHL defective renal carcinoma cell line RCC4. RCC4+ is stably transfected with an expression plasmid encoding wild-type VHL and RCC4− with an empty vector. They were cultured at 37°C in RPMI 1640 medium supplemented with 10% FBS, 2 mM l-glutamine, and 100 U/ml penicillin streptomycin (Invitrogen, Paisley, UK) in a humidified air/5% CO2 atmosphere. They were used soon after reaching 80% confluence. Total RNA was isolated from harvested kidneys 0, 2, 4, 8, and 24 h after Xe preconditioning using the RNeasy Mini Kit (Qiagen) according to the manufacturer's protocol, followed by quantification based on ultraviolet absorption at 260 nm. Kidneys from mice exposed to 70% N2 balanced with O2 were used as controls. Extracted RNA was then converted to cDNA using SuperScript II reverse transcriptase (Invitrogen) for single-stranded cDNA synthesis. The cDNA product was used for real-time PCR in the presence of SYBR Green PCR Master Mix (Roche Diagnostics Ltd., Welwyn Garden City, UK). The amplification was performed in a RotorGene Sequence Detector (Corbett Research, Eaton Socon, UK) at 95°C for 10 min, followed by 45 cycles of 95°C for 20 s, 58°C for 20 s, and 72°C for 20 s. Gene expression levels were assessed by the comparative threshold method, using β-actin as the internal control. PCR primers (Invitrogen) were designed with sequences as follows: HIF-1α forward 5′-TCAAGTCAGCAACGTGGAAG-3′, reverse 5′-TATCGAGGCTGTGTCGACTG-3′; EPO forward 5′-AGTCGCGTTCTGGAGAGGTA-3′, reverse 5′-AGGATGGCTTCTGAGAGCAG-3′; and β-actin forward 5′-AGCCATGTACGTAGCCATCC-3′, reverse 5′-CTCTCAGCTGTGGTGGTGAA-3′. PCR products were separated by electrophoresis on a 2% agarose gel containing the fluorescent dye ethidium bromide and visualized via a Fluor-S Multi-Imager (BioRad, Hemel Hempstead, UK) for illustration purposes or the ratio of HIF-1α mRNA/β-actin mRNA were calculated and then normalized with control for quantitative analysis. Proteins were extracted from the cell lines or renal cortices at 0, 2, 4, 8, and 24 h after Xe preconditioning by cell disruption in cell lysis buffer (Cell Signaling, Hitchin, UK) and sonication with an ultrasonic probe, followed by centrifugation at 10,000 × g for 10 min at 4°C. The supernatant was collected for Western blotting. Samples containing 30 μg of extracted protein, as determined by the Bradford protein assay (BioRad), were loaded on a NuPAGE 4 to 12% Bis-Tris gel (Invitrogen) for protein fractionation by electrophoresis and then electrotransferred to a nitrocellulose membrane (Hybond ECL; Amersham Biosciences, Little Chalfont, UK). Blots were blocked with 5% nonfat dry milk in TBS (pH 8.0, containing 0.1% Tween-20) and probed with appropriate antibodies followed by horseradish peroxidase–conjugated secondary antibodies and visualization with enhanced chemiluminescence (Cell Signaling). The sum score was calculated from the analysis of 10 cortical tubules per cross-section stained with hematoxylin and eosin (10 sections per kidney) by using a modified scoring system13: 0, no damage; 1, mild damage: rounded epithelial cells and dilated tubular lumen; 2, moderate damage: flattened epithelial cells, loss of nuclear staining, and substantially dilated lumen; and 3, severe damage: destroyed tubules with no nuclear staining of epithelial cells. Both creatinine and urea were measured in 100 μl of plasma with an Olympus AU640 analyzer (Diamond Diagnostics, Watford, UK). Apoptosis of tubular epithelial cells was detected by in situ TUNEL assay (Obiogene, London, UK) according to the manufacturer's instructions. The fixed cryostat sections were washed with PBS and then treated with proteinase K 20 μg/ml at room temperature for 15 min. For positive controls, sections were treated with nuclease (R&D Systems, Abingdon, UK) at 37°C for 15 min. The sections were quenched in 3% hydrogen peroxide in PBS for 5 min. The quenched sections were labeled with TDT enzyme at 37°C for 1 h in a humidified chamber and subsequently incubated with anti-digoxygenin conjugated to horseradish peroxidase for 30 min at room temperature. They were then stained with DAB followed by counterstaining with methyl green. The sum of TUNEL-positive cells in an objective grid from 10 areas of randomly selected renal cortex was counted under a ×40 objective lens by an investigator who was blinded to the experimental protocol. Statistical comparison was by ANOVA followed by post hoc Student-Newman-Keul test where appropriate. Survival was analyzed by Kaplan-Meier test. P < 0.05 was considered as statistically significant. M.M. is a paid consultant for Air Products, a company that is interested in developing clinical applications for medical gases, including Xe. This work was supported by an Association of Anesthetists of Great Britain & Ireland grant and by a Westminster Medical School Research Trust (London, UK) grant to D.M.